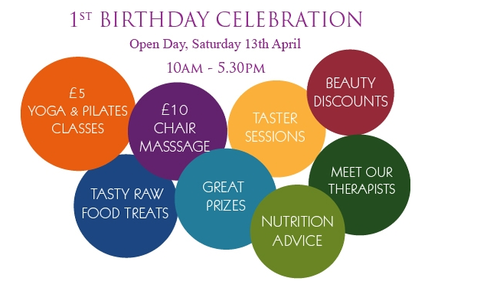 I started teaching at Embody Wellness studio when it opened this time last year and I am so pleased we will get to welcome you and have an all-day celebration this Saturday! Christian De Ponte and Bruce Tegart created a beautiful space in Vauxhall where yoga studios are not as readily at hand as in other parts of London. You walk into an open space that sees the reception area as well as a chilled out lounge where you can sip some delicious tea while reading one of the magazines put at your disposal on the coffee table. On the first floor is the studio, an airy and light space which is my favourite place to teach in! The whole centre is an oasis of peace and quiet, and the team of professionals at Embody Wellness can not only help you get healthier and fitter, beauticians Zhanna and Jennifer can also make your skin feel like velvet from head to toe! I will be closing the event by teaching a Vinyasa Flow class, 16.30-17.15. Please pre-book your space online to avoid any disappointment and see you there. Happy very first birthday, Embody, and to many more to come!